Synopsis: Two misfits. One extraordinary love. Eleanor… Red hair, wrong clothes. Standing behind him until he turns his head. Lying beside him until he wakes up. Making everyone else seem drabber and flatter and never good enough. Park… He knows she’ll love a song before he plays it for her. He laughs at her jokes before she ever gets to the punch line. There’s a place on his chest, just below his throat, that makes her want to keep promises. I read this book because I really wanted to read about first love. I figured I’d think about my first love and cry because first loves are the most poignant. Eleanor is a red headed, bigger, sweet girl who’s life is much harder than it should be. She lives with her mother, brothers and sisters, and a stepfather who is anything but a father. She meets Park on the bus, a popular boy who realizes that the girl he loves is more important than the appearances he’s kept up. They bond over music, comics, and a comfortableness that can only come from chemistry. They bond over her uncomfortable home life and his strange relationship with his father. It’s a quiet, slow, and probing kind of love. They’re both scared, but neither of them can escape it. Set in the 80s where music and comics are at their finest, this book is also a splash of culture and color. 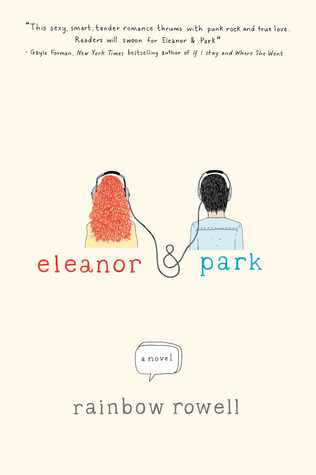 It’s a wonderful look into the insecurities of high school, family, and love. I highly recommend this book.